Unknown Horizons is based on the Flexible Isometric Free Engine or FIFE. 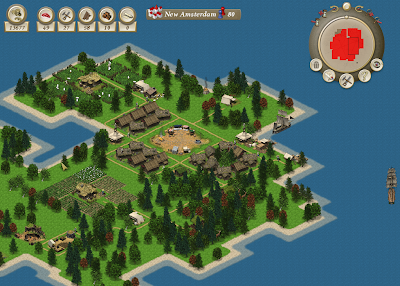 The game emphasizes on maintaining an economy and city building. You can expand your small settlement to a strong and wealthy colony, collect taxes and supply your inhabitants with valuable goods. The aim is to increase your power and create a well balanced economy with strategic trade and diplomacy. Both single player and multi player games modes are available. Unknown Horizons is completely compatible with Debian Free Software Guidelines (DFSG). The game is heavily under development with more and more core gameplay elements keep rolling in so expect new content to be added in future. Note: If you already have an older version of unknown-horizons installed, uninstall it before installing this version - 2011.1. Also remove the .unknown-horizons folder found in your home directory. Tip: If the game runs slow on your system, try changing graphic rendering mode to SDL from OpenGL. The game does not recommend it and warns about possible graphical glitches but it may improve performance on your system.